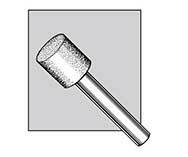 Internal grinding is arguably the most challenging of all grinding applications. 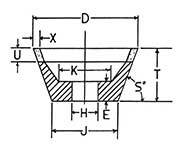 In no other type of grinding can the entire range of parameters change from one job to the next. Therefore, it is necessary to consider the specifics of each job individually in order to arrive at the wheel best suited for the job. In order to maximize performance capabilities and profit margins, choosing the correct wheel for a job is extremely important. Unfortunately, this isn't always the easiest decision to make, as many factors play into such a selection. One must consider material to be ground, size of area to be ground, amount of stock to be removed, finish desired, machine capabilities and a number of other factors. Low concentration provides more aggressive cutting, coarser finish and potentially higher wheel wear while high concentration provides less aggressive cutting, finer finish and lower wheel wear. 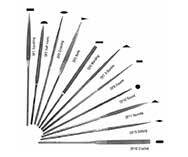 Diagrind, Inc. standard is 100 concentration, variations are available upon request. 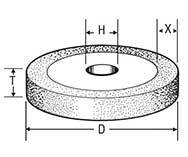 NOTE: For grinding applications requiring a high grinding wheel diameter to hole diameter ratio (see "Hole Size" above) less than 100 concentration is recommended. Required information includes type of machine (jig grinder, I.D. grinder, machine center, etc.) 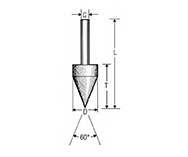 and spindle r.p.m. capabilities. 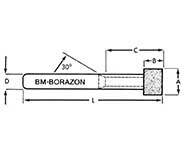 Machines should have a rigid wheel head spindle, rigid bearings in the headstock spindle, and feed increments of .0001" or smaller. Industry-wide, these machines have a wide variety of r.p.m. ranges, and Diagrind, Inc. has addressed this with the development of a variety of bonding systems which would maximize performance on any machine. Using spindle speed and the wheel diameter and the Diagrind, Inc. wheel speed calculator (free upon request), one can determine the surface feet per minute (SFPM) for a particular job, which will lead to the next step. Finally, the grit of the wheel can be determined. This is accomplished by considering the median between stock removal and finish desired. A coarse grit will be more aggressive, but will consequently leave a rough finish, while the opposite is true for a finer grit. 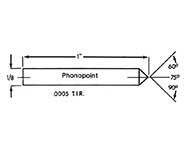 Diagrind, Inc. has experience working with grits as coarse as 30/40 and as fine as 20,000, so arriving at a figure to suit the need of individual customers is a commonplace operation. In the case of Superabrasive internal grinding, the wheel is generally 40-60% the size of the hole diameter being ground. Larger diameter holes will require a lower percentage, while smaller holes require a greater percentage (see illustrations). 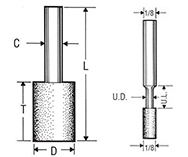 The depth of the hole determines the length of the abrasive as well as the undercut (if required) and the overall length of the mandrel (abrasive length + shank length). 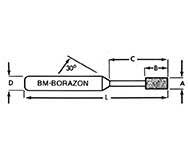 The other basic variable to be considered in wheel size is shank diameter, and that is determined by the size of the collet, or simply by choosing the stiffest shank that will fit reasonably with the wheel diameter. 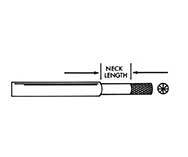 In most cases, if the wheel diameter is smaller or equivalent in size to the shank diameter, an undercut may be required behind the wheel for needed clearance (see Illustration 1). Proper coolant will enhance the performance of the wheel as well as the finish in cases of heavy stock removal or fine finish requirements. Diamond wheels require a synthetic coolant, while CBN wheels use oil or water-soluble oil. See the Bond Selection Guide for usage information. 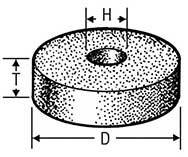 This guideline can be effective in helping to determine the proper wheel for a specific grinding job. However, as stated before, every internal grinding job can be unique, and require a unique solution. With over 25-years of experience in the field, Diagrind, Inc. is well equipped to handle even the toughest internal grinding jobs, so feel free to contact us with any questions, we'll be glad to help.